Michael Mackin rides BART for an hour every day. Is that enough to hurt his ears? This question came from listener Michael Mackin. Since this story first aired in September 2016, nearly all of BART’s legacy fleet have new, quieter wheels and 60 new cars have gone into service. Every morning, Michael Mackin gets on BART with two bags. There’s a satchel where he keeps all his work stuff and a backpack where he carries Cooper and Jetta, his two adorable papillions. They’re the most well-behaved dogs you've ever seen. 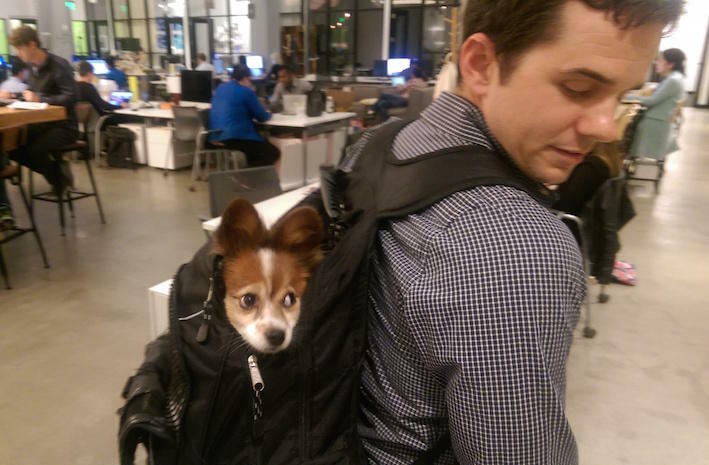 And they are totally chill commuting in a backpack. But their owner doesn't have such a pleasant time riding BART. BART hurts his ears. And Mackin is more concerned about his hearing than the average person. As a kid growing up in Baltimore, Mackin loved swimming. One day, he was swimming in a pool and he felt pain in his ear. It turned out that he had an ear infection. The infection, combined with the water pressure in the pool, burst his eardrum. Since then, he likes to be cautious about his hearing. And so Mackin wrote into Hey Area, KALW's collaborative reporting project. He wanted to know: Can BART damage your hearing? 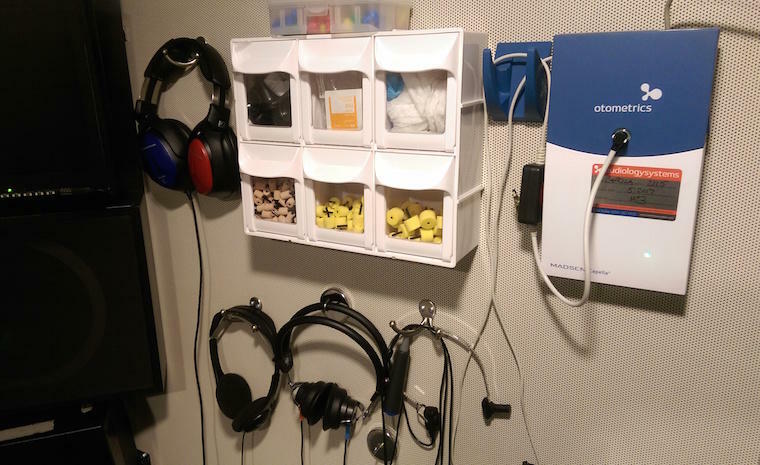 Dr. Shu-en Lim, Clinical Director of the Hearing and Balance Center at the University of the Pacific, is sitting in one of the quietest places in San Francisco: a silent room where she gives hearing tests to her patients. Equipment in the sound booth at the University of the Pacific Hearing & Balance Center. Daily noise in the city can be a strain for anybody. You might leave a BART ride, a concert, or even a noisy restaurant with your ears ringing. Those hairs will reattach themselves. But only so many times. So being in loud places like BART every day can damage your hearing. How much harm depends on the intensity of the noise, and the duration of the exposure. Dr. Lim gets out the charts. We’re looking at a bar graph showing how long you can safely be exposed to various levels of sound. If Mackin rides BART for an hour every day, how loud is too loud? According to the National Institute for Occupational Safety and Health (NIOSH), the safe limit for an hour is 94 decibels, about as loud as sitting in the back row of a Billy Joel concert. Louder than that may be harmful. Dr. Lim gathers up some fancy equipment and leaves the silent sanctuary of the testing booth. It’s time to do an experiment. 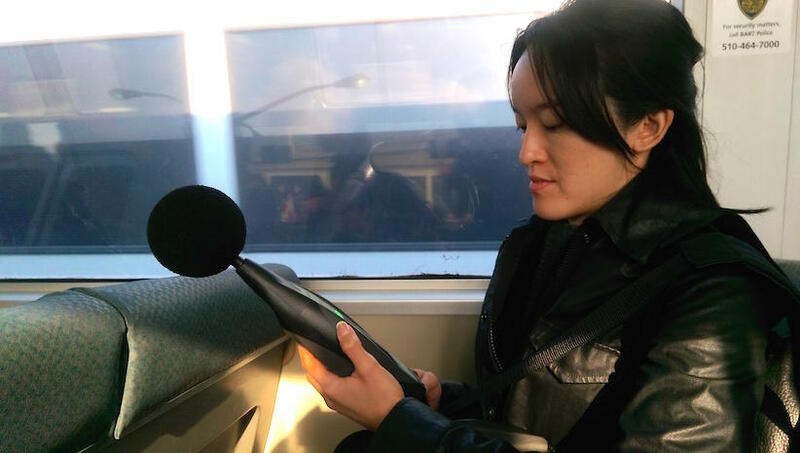 Dr. Shu-en Lim, Clinical Director of the Hearing and Balance Center at the University of the Pacific, reads a sound-level meter on BART. Dr. Lim heads down to the Powell BART station, holding a device that looks like a giant high tech thermometer with a big foam ball at the end. Her plan is to test the noise exposure going through the noisiest part of Mackin’s commute: from downtown San Francisco to MacArthur station in Oakland, and back again. Heading into the tunnel, the train starts to get loud. “We got a new peak of 113,” Dr. Lim calls out over the noise. 113 decibels is a lot. But that’s the loudest she recorded. The average was much lower. Remember, to be compliant with NIOSH recommendations, she hoped to find an average of less than 94 decibels. So based on NIOSH standards and our brief sample ... BART passes! But, says Dr. Lim, “you’re better safe than sorry.” Everyone is different, and repeated exposure can still add up to damage. In her professional opinion, BART riders like Michael Mackin should protect their ears anyway. Mackin, our question-asker, was happy to hear the news. It turns out that he owns noise-canceling earbuds, and he wears them like a pro. Instead of drowning out the BART noise with loud music, which can cause even more damage, he says he’ll often activate the noise-canceling function without playing anything. But the noise of BART still bothers him. So he wondered whether BART was doing anything to make the experience quieter for him, fellow passengers, and operators. As it turns out, BART’s been working on it. 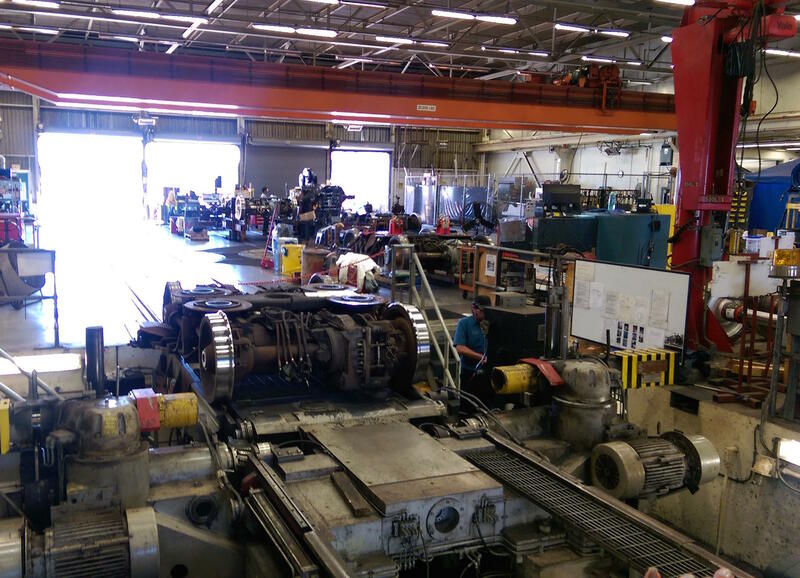 A wheel truing machine at BART's Hayward Maintenance Complex. BART's noisy wheels will be re-shaped by machinery that BART already uses for maintenance. At BART’s Hayward maintenance shop, spokesperson Alicia Trost is shouting over the din of workers servicing thirty-year-old trains. “We have found a way to prevent the loud screech that everybody knows,” she says. Behind her is the wheel truing machine, which grinds wheels like a potter shapes a spinning vase. “This will be the machine that will get the new attachments to cut the new profile,” Trost says. The rims of the old wheels lie flat on the rails. The new rims have a slightly tapered design that helps them turn more quietly. The new wheel profile was developed as part of the “Fleet of the Future” project for new BART trains. The design works for old trains too. Using the same machinery they already use to smooth wheels down, they can reshape old wheels into the new design. But don’t expect to hear the change immediately. Trost says the old wheels will be modified gradually over the next two to three years. Should dogs protect their ears on BART? That’s a question for another day. Besides, these dogs don’t seem to be bothered. This story first aired in September 2016 as part of KALW’s listener-driven reporting project Hey Area. Got a question for Hey Area? Ask it here. In 2018, Bay Area commuters will be able to go a little bit farther on BART. The transit agency is building a 10-mile extension from the Pittsburgh station, to Antioch. Hey Area: Why is the Richmond-San Rafael Bridge so long? It’s 7:45 AM and I’m in the car with Albany resident Steve Shea. We’re headed from the East Bay to his office in Novato. “Yeah I’ve been commuting to this job ten years now,” he says, his hands on the wheel, eyes fixed on traffic ahead. What's beneath those brick circles in San Francisco intersections? Chava Kronenberg is on a manhole hunt. “Oh! Wow! There it is! We have a winner!” she exclaims near the intersection of Geary Boulevard and 5th Avenue in San Francisco.